Webinars have been around for almost 20 years. 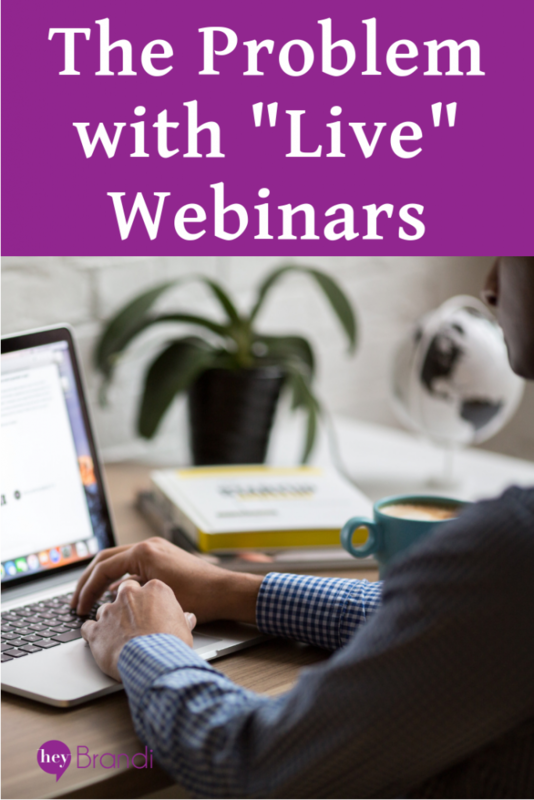 But in the last few years, a new version of webinars have emerged, and they’ve taken the online marketing space by storm. I’m talking about those webinars that are framed to look live – right down the fact that they have a Q&A component. Then once you get 5 minutes in you discover that it was all pre-recorded. Once you’ve accidentally signed up for one of these little beauties, you’ll recognize the signs pretty clearly. Sign #1: When you sign up, a webinar just happens to be starting in the next 15 minutes (or less). Sign #2: The webinar is happening every hour – especially overnight! Trust me, no business owner is just sitting around waiting for you to sign up for them to present their webinar at any hour of the day or night! Sign #3: The references are off just a bit. For example, the host may mention spring weather even though it’s summer. Or a holiday that’s already past. These are sure signs that the webinar was recorded well in advance and is now on auto-play. 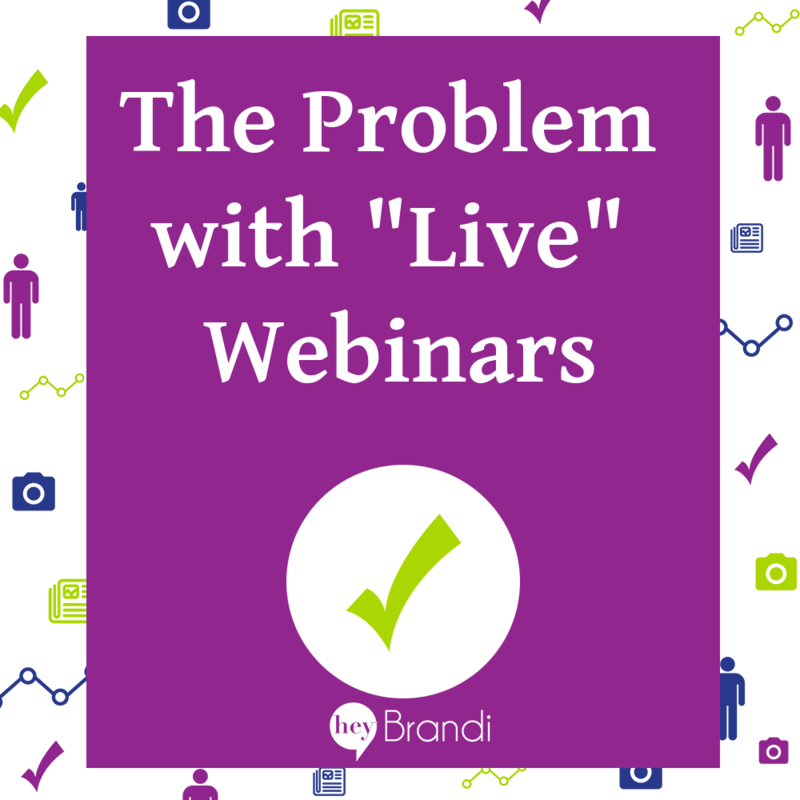 Why are “fake live” webinars bad? The biggest reason is this: You’re starting the relationship with your customers with a lie. You’re not there at 2 am to help them overcome their mindset issues when it comes to leaving their jobs – not any more than Chalene Johnson is doing live infomercials at 2 am for PiYo. It doesn’t matter that there is software out there that makes it look like everything is live – right down to having fake attendees who ask fake questions at the most opportune fake moments. It doesn’t matter that you’re seeing other people do it. What matters is the relationship that you’re building with your customers. A relationship based on dishonesty – even with the best of intentions, isn’t going to last. Many people go online to say that they’ll never buy from so-and-so because they registered for a webinar and it turned out to just be a pre-recorded video. Create a regular recurring webinar program – where you do show up to present live (even if it’s the same presentation every week). The good news is, you only have to do the webinar if someone registers! If they do register but don’t show up live, you can send them a previously recorded version. Develop a high-quality video presentation that people can register to watch on their schedule. By creating a dedicated video lead magnet, you can have a perfect presentation, from audio to slide timing. Then, provide an easy way for people to send you questions – that you reply to! You’ll notice that I said “create a high-quality video presentation to use as a lead magnet.” When you want to use a video as a lead magnet or in a paid course, don’t just re-use an existing Facebook Live unless the live interaction is the heart of the presentation. (For example, if you want to provide a sneak preview of your coaching style or a mastermind group.) I can’t tell you how many videos I’ve turned off because there was too much time wasted saying hello to every person who logged in, asking them how their day was, and asking them to confirm that they can see and hear the video. It’s just annoying and disrespectful when it’s a freebie, but when it’s part of a paid product, it feels like the seller didn’t invest in their product. Remember, as a product creator and business owner; you get to define the relationship you want to have with your customers. I strive for a relationship based on honesty and mutual respect. 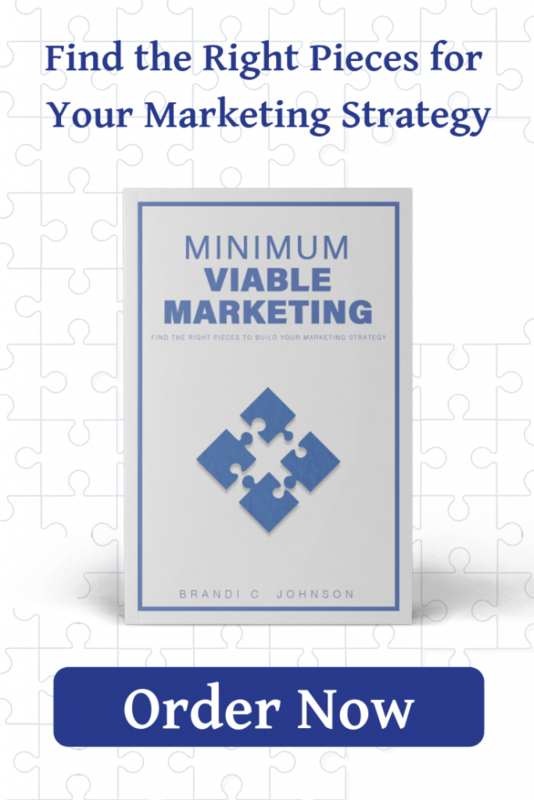 When you’re deciding what tools you’ll use to promote, consider your business values as well.